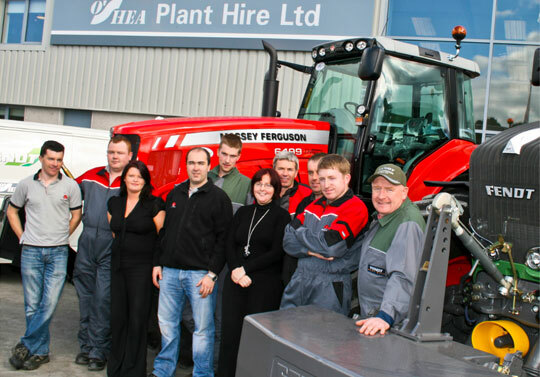 O’Shea Agri & Plant Sales was established in March 2008 as the main Massey Ferguson and Fendt dealership in Kilkenny. Located on the N7 main Kilkenny to Dublin route, just outside Castlecomer, our new, state-of-the-art premises incorporates a busy forecourt, stores, workshop and our sister company, O’Shea Plant Hire Ltd.
We have a full range of Massey Ferguson and Fendt parts along with general parts and accessories for all makes of tractors and machinery. We stock oils, grease and filters as well as making and repairing hydraulic pipes. The shop has a large selection of workwear for both adults and children, toys and other merchandise. The stores and workshop management team have extensive experience in their respective areas and are fully versed in the most up to date diagnostics for Massey Ferguson and Fendt. Our opening hours are Monday to Friday 9.00 a.m. – 6.00 p.m. (we are open through lunch) and Saturday 9.00 a.m. – 1.00 p.m.